The Mid-Atlantic Christian University Net Price Calculator is designed to give you an early indication on your eligibility for financial aid. Calculations are based on first-time, full-time students attending Mid-Atlantic Christian University in 2009-2010 and will vary from student to student. The calculator measures the financial strength of your family and uses other parameters that you provide to estimate the amount of grants, scholarships and other financial aid that might be available to you. Your "net price" is the difference between that amount and the cost of attendance. Completing the calculator should take just a few minutes of your time. The net price calculator will only give you an estimate of eligibility. The calculator is intended for U.S. citizens and permanent residents (students otherwise eligible for federal aid). International students may use the calculator but the calculations will have a wider variance of accuracy. The financial aid office has the final word on your financial aid award. Please contact the Financial Aid Office for more information about your ability to recieve financial aid. Information entered into the Net Price Calculator will not be retained by Mid-Atlantic Christian University. This is not an application for financial aid. You must complete the Free Application for Federal Student Aid (FAFSA) as soon as possible after January 1 of the year you plan to attend college. Mid-Atlantic Christian University has a wide range of financial aid and scholarships available to students which can greatly impact your "net price." 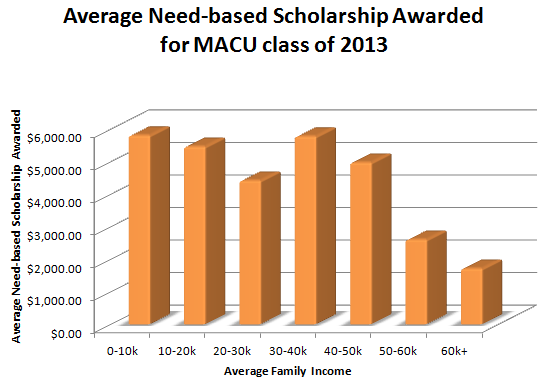 Please take a look at the MACU "Types of Aid" page for more information. Regardless of what your estimated results are, our goal is to allow every student who is admitted to MACU the option to attend. The Financial Aid Office is available to answer any questions you have regarding the results you have received using the Mid-Atlantic Christian University Net Price Calculator. If you have general questions, concerns or comments about the Net Price Calculator, please feel free to contact us at FinancialAid@macuniversity.edu. Please report technical issues to the Mid-Atlantic Office of Information Technology at itsupport@macuniversity.edu.